This Persistence Market Research report examines the global forklift truck market for the period 2017–2021. Forklift trucks are motorized vehicles primarily used for independent lifting, movement, and placement of discrete loads throughout a facility. These mobile loading trucks can be outfitted with forks for pallet-based unit load picking and for loads that are not palletized. These vehicles can be used with a variety of attachments such as platforms, grippers, or clamps. To move lighter loads, manually powered vehicles such as carts and hand trucks are used. One of the challenging tasks in warehouses and distribution centers is that of placing and removing loads from storage racks, loading and unloading trailers in the yard or at the dock, delivering components to the assembly line, and positioning loads for further handling processes. To complete such tasks, forklift trucks are used across various industries such as aerospace, automotive, food and beverages, construction, consumer goods, e-commerce, and retail. In order to have an ease of understanding and for the better organization of the report, the report on global forklift truck market has been divided into four distinct parts. The first part of the report contains the introduction section that contains the executive summary of the report along with the market taxonomy and the definition of forklift trucks. This valuable section of the report also contains information on the value chain analysis of the global forklift truck market. In addition, the macroeconomic factors affecting the global forklift truck market along with the opportunity analysis for this market are also provided in this section of the report. Also, in this section of the report, the market dynamics of the global forklift truck market in the form of drivers, restraints and trends are given to offer a deep understanding of this market. The second part of the report contains the global forklift truck market analysis and forecast by product type, technology, class and by region. This section of the report contains important market numbers in the form of market attractiveness index, incremental dollar opportunity and basis point share analysis. The third part of the report contains the regional forklift truck market analysis and the regions are chosen as per the market taxonomy. In this section of the report, the regional market numbers are discussed in great detail. Another part of the report features the competition landscape of the global forklift truck market and has information on the key players operating in this market. The competition landscape contains detailed information on the important companies operating in the global forklift truck market in the form of company description, product overview, key developments, strategic overview and key financials of each of the featured companies along with the SWOT analysis of the companies. This competition landscape is a valuable part of the report as it contains all the necessary information to study the leading companies operating in the global forklift truck market in detail and also reveals how they implement their strategies and vision to stay at top in this highly competitive market. Overall market size has been analysed through historical data, primary responses, and public domain data. Revenue of companies in the global forklift truck market has been benchmarked to ascertain the market size for the base year. Macroeconomic indicators such as GDP and industry growth have been considered to forecast the market size over the forecast period. The historical growth trend of end-use industries, market participants’ performance, as well as the present macro-economic outlook has been taken into consideration for estimating the overall market trend forecast. This data is then validated using the triangulation method and is extensively scrutinised using advanced tools to garner quantitative and qualitative insights into the global forklift truck market. From a market valuation of just under US$ 42 Bn in 2017, the global market for forklift trucks is projected to reach a valuation in excess of US$ 55 Bn by 2021. A growth rate of 7.5% across four years is a clear indication of the surging demand for these vehicles across various end-use industries. The global market for forklift trucks is likely to benefit immensely from the rapidly growing e-commerce sector around the world. This is due to the fact that the e-commerce industry caters to a diverse set of portfolios in various product segments such as books, electronic goods, apparels and cosmetics among others. Also, the competition is cut-throat in the e-commerce sector. Hence, in order to fight the tough competition and grow and maintain the number of customers, a number of e-commerce companies are shelling out measures like introduction of free shipping to the customers. In addition, simple exchange and return procedures have also been adopted by the e-commerce companies to retain and grow their customer base and to maintain a brand value. To cater to such wide range of services, the warehousing and distribution centers catering to such e-commerce companies need to keep pace with the rapidly growing e-commerce sector. Hence, there is a need for such warehouses and distribution centers to operate in an efficient manner that saves time and eases the operations. This is where the forklift trucks come in the picture. The construction industry is getting on track all around the world and there is an increasing demand for forklift trucks in this sector. In the construction sector, forklift trucks are mainly used in lifting various types of construction materials such as steel, wood and mortar. This growth in the construction sector, particularly in the emerging economies, where there is a need of construction of large scale public infrastructure, bodes well for the global forklift truck market. Specifically catering to the construction industry, the counterbalance type of forklift trucks are ideal, as the forklift trucks have to travel on rough terrains and uneven surfaces. Thus, counterbalance type of forklift trucks that possess inflatable tires, due to which the forklift trucks can maneuver easily on the rough and uneven surfaces are used. Also, such type of forklift trucks have enough power so that they can reach high speeds. With the rapid advancement in technology, there is a lot of potential for electric-powered forklift trucks due to their growing applications and popularity. Such type of electric powered forklift trucks are ideal for use in the indoor spaces, and they can load and unload heavy goods from the ground level or from the docks. A major advantage of using electric powered forklift trucks is that there is no need to store fuel for them at their place of operation. The use of electric powered forklift trucks is gaining huge ground in the developed regions of North America and Europe, which boast of an established e-commerce industry and the strict norms for emissions and concerns for sustainability. However, in the emerging economies, there is still preference for IC-engine forklift trucks. 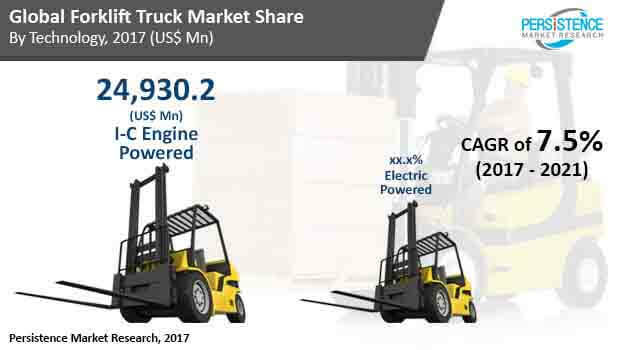 In addition, forklift trucks that are powered on alternative sources of energy such as hydrogen are also gaining traction in the global forklift truck market. CLARK Material Handling Co., Ltd.